This is Sooooooo Soooooooo EASY! Really, easy and dramatic presentation, delicious cinnamon toast/bread baked fresh. Your kitchen will smell like heaven and your guests will talk about this all day. Banana Nut Muffins or Banana Bread... But I like Muffins! Mini Muffins... Make Ahead Delights! Grits flavored with SWEET POTATOES, made spicy with some pepper ADOBE Sauce and eggs... You will LOVE this! Quiche Cake with a Hash Brown Crust... Real Men will eat this Tall CAKE! Made in a Springform cake pan, EXTRA TALL makes a great presentation. 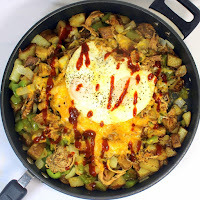 Sausage, Eggs, Hash Browns and seasonings... A dramatic presentation for a single pan BREAKFAST (anytime) MEAL! (And a Great Lent "No Meat on Friday" Idea)... LOVE THIS TAKE on the Classic... Add a Johnny Cake Pancake, a Lump Crap Old BAY Seasoned Crab Cake and the perfect OOZY Poached Egg (DIY for those in the post as well) and you have a GREAT BRUNCH STANDOUT! I discovered them on a visit to NYC 30 years ago and they still make me feel... exotic! But they are so easy to make. Topped with apple sauce or sour cream. Latkas... Potato Pancakes... Latkes are all Europe (and Kansas). Often by a different name, from Ireland to Russia... Sweden all the way south to Africa, all claim this dish as their own. Me, I discovered them in a New York Deli back in the 80's and have loved them ever since... So simple and nostalgic for me. 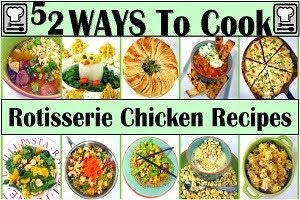 Here's an easy to follow recipe, complete with LOTS of photo instructions. Latkes, Potato Pancakes can be simple or dressed up. I make 'em every year for Christmas Breakfast and even added an appetizer course for my BIG Christmas dinner. So consider the SIMPLE Hash Brown Potato easily made into Latkas, Add a few Toppings like Sour Cream, Apple Sauce, Pickled Red Onions and Sugar Cured Salmon and you have a fun idea for a SUPER PARTY TREAT! Red Lobster Copy Cat Garlic Cheesy Biscuits... For many, the best part of a trip to Red Lobster restaurants starts at the basket of rolls... Sweet, creamy, tender and flaky Buttery soft, Cheesy salty and delicious! 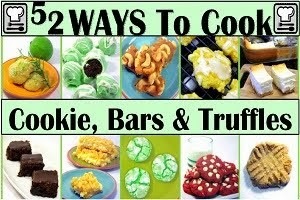 Here's the copy cat recipe that you can now make at home... EASY ANYONE CAN DO IT! Honey Chipotle Glazed Baked Bacon... EASY EASY EASY... Baking Bacon is Soooo Easy and comes out PERFECT everytime. But even better is adding a glaze of sweet honey and then spice the sweet with the heat of Chipotle Pepper Spice. So, Sweet Heat and Salty Bacon!!! BACON - Bourbon Maple Pepper BACON BACON BACON!!! BACON - Bourbon Maple Pepper BACON BACON BACON !!! This is SO EASY... Clean up is Fast and Easy PERFECT flat look every time Crisp and perfect texture Every Time... BUT THE BOURBON/Sweet SYRUP and Freshly CRACKED PEPPER turns this bacon into something MEMORABLE... Why Don't I make this every day... FAST EASY AND DELICIOUS!!! Mango Glazed Bacon ala Bobby Flay... BACON, the perfect food gets a Bobby Flay make over.. Sweetened glaze with the flavors of the tropics... And makes a great mango bacon wrapped sea scallop! Like a Vanilla or Chocolate Milk Shake for BREAKFAST! Ever wonder why diner Pancakes taste so much better than yours... Scratch made recipe with that Diner Secret - MALTED MILK POWDER in place of Sugar! Tips and tricks to make the BEST PANCAKES EVER! Yeap, MALTED, like the olde malt shoppe gang drank in their milk shakes. But mix that same malt powder into a scratch made (but easy) waffle batter and you have a wonderful extra sweet waffle. Mix in a colorful handful of blueberries and yo have the BEST waffles around. a good waffle deserves the full Bed and Breakfast treatment with Maple Syrup, and for an extra treat, have a dollop of whipped cream handy. Scratch recipe, but it comes together almost as fast as the prepackaged. PLUS, a secret easy ingredient makes this just as delicious as any of those fancy restaurants serve in no time at all (well, maybe 3-4 minutes... but I digress). Crunchy on the outside, sweet and creamy on the inside and all infused with cinnamon and apples... inside and out! AND AMAZINGLY EASY! It's a fresh take on FRIED CHICKEN. Never again will I throw out the pickle brine from Dill Pickles. Very distinctive flavor but also about the most tender and juicy fried chicken you can imagine. Makes great Chicken and Waffles, top with a little honey and what a treat! Rotisserie Chicken and Waffles This may be the easiest recipe ever, but honestly is one of the tastiest. Salty and sweet, Savory and filled with flavor. 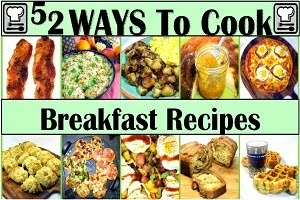 Adds a simple cost effective addition to your breakfast menu. Dollar menu fast food at home! Made simple with just a single thigh from a Rotisserie Chicken. Quick Cheesy Chicken Sweet Corn Muffins Breakfast, Lunch, Snacks... These are fantastic! 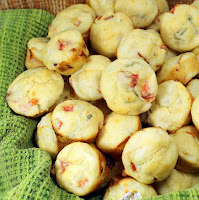 Sharp Cheddar Cheese, onions, peppers, even a secret ingredient that makes normally dry muffins amazingly sweet, moist and tender. Sweet and savory, LOADED with veggies and chicken and delicious... LOVE These! The hearty base for my favorite breakfast, Fried Chicken and Waffles! But these waffles are CornBread mixed with over 2 cups of herbs, vegetables and spicy flavors. Crispy crunchy outside, sweet and tender inside and packed with flavors. 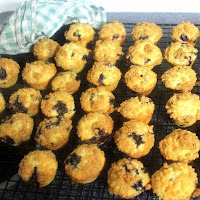 you can certainly use the same recipe for THE BEST Muffins or CornBread around! New twist to an old stand by recipe. Those last 2 bananas, the over ripe, turning black and mushy ones are turned into a wonderful breakfast snack bread. Like a marriage of Cinnamon toast and Banana Muffins! And EASY! This is a recipe PERFECT for those over ripe browning bananas! It also uses an extra bit of sour cream added for an extra creamy tasting muffin. Light and airy, loaded with flavors and textures. I love the crunch of the walnuts, kids LOVE Chocolate Chips in about anything. Let's do some baking today!!! Tropically Sweet Banana Muffins with MANGO! Everyone's favorite use of over ripe bananas gets a sweet tropical makeover with MANGO! 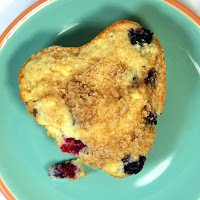 Easy to follow recipe that guarantees about the most moist muffin you have ever made. You will HEART these! Elvis's Halloween Banana Muffins... BTW, this works just fine with Snicker, a handful of M&M's (plain or peanut), Twix... Almost anything chocolate... But Elvis would prefer the peanut Butter Banana combo Your kids didn't need all that candy anyway. This way they are almost getting a healthy morning after breakfast... EASY and FUN!!! Peaches and Pecan Praline Sauce over AUTHENTIC FRENCH TOAST...Oh My GOD... So decadent, but SOOOO GOOD... Amazing thick custard like bread (think Bread Pudding) topped with Peaches and a rich delicious New Orleans classic Pecan Praline Sauce... DELICIOUS!!! MAPLE PECAN FRENCH TOAST! DELICIOUS Specialty Breakfast in Bed worthy. With just a few tips and hints that make this better than average, Upscale restaurant quality tips to get the best at home... And those warm maple soaked softened pecans are the best!!! This is such a surprise... Seemingly a simple grilled cheese, but so much more. Seemingly a grilled cheese made with French toast, making this a WONDERFUL BREAKFAST IDEA... but so much more. More like a Bread pudding with a crispy crunchy outside, but the center is creamy almost custard like. BEST EVER GRILLED CHEESE!!! 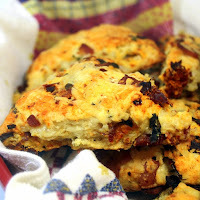 Savory Bread Pudding-Red Lobster Copy Cat Garlic Biscuits... BREAD PUDDING - but so much more... SAVORY made with RED LOBSTER GARLIC CHEESY Copy cat BISCUITS! add some caramelized onions, more cheese and meat from a leg of a ROTISSERIE CHICKEN and you have the most amazing lunch!!! One of my favorite dishes, Almost all left overs makes this cost... nothing! OH BOY do I love these. 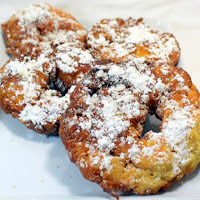 Sweet candy ginger and the savory aspects of ginger powder combine with the fruity flavors of peaches for a more perfect union ... New Orleans memories for a better Beignet EASY DIY !!! The Italian version of an Omelette... Served Open faced, and made with eggs. Other than that, not many rules. 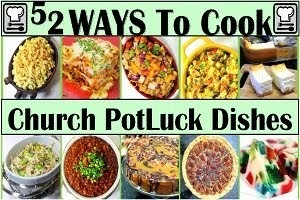 Mostly the dish is used to make leftovers shine. A filling breakfast, lunch or a wonderful starter, easily serves 8 as an Antipasto. This is my delicious sausage and red onion Frittata that I occasionally make as a weeknight no company dinner for two. Eggs Benedict... With options for 7 Types! PLUS a Hollandaise Sauce that anyone can make! Eggs Benedict - 2 Ways... well, 7 actually with an idea for 14 ways... It was a COLD RAINY Day... SO I made Chicken, Shrimp, Steak, Bacon, Canadian Bacon, Vegetarian and Salmon Versions of the classic... I included PHOTO HOW TO instructions for Hollandaise Sauce (easy) and how to Poach an Egg (EASY)... So now you can get the vacation treat at HOME! rotisserie chicken eggs Benedict inspired open faced sandwich with a quicky easy blender Hollandaise sauce recipe". A long title, and I could have just said, "Rotisserie Chicken Eggs Benedict", but with the easy fast never fail Hollandaise Sauce recipe and using garlic toast in place of an English Muffin, I just thought the idea of "whatever I have in the fridge" Eggs Benedict made more sense for a title. ... LOVE THIS TAKE on the Classic... Add a Johnny Cake Pancake, a Lump Crap Old BAY Seasoned Crab Cake and the perfect OOZY Poached Egg (DIY for those in the post as well) and you have a GREAT BRUNCH STANDOUT! Eggs in Purgatory Uova al purgatorio This is soooooo easy, and cheap. 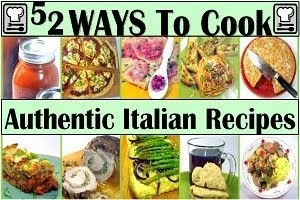 Especially if you make your own Herbed Tomato Sauce for Pasta, Pizza or Cooking! You are simply poaching the eggs in a tomato sauce, adding great flavor to the simple egg! Tiny Chicken and Blue Cheese Popovers... These little gems are absolutely delicious... A soft popover dough recipe that puffs up as the cook around little bits of blue cheese and bits of chicken. Could be THE perfect appetizer,... And a delicious ON THE GO Breakfast snack! 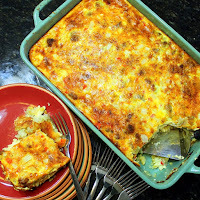 A STRATA Dish calls for separate layers of a little bit of bread pudding (the bottom), a middle layer of a little bit of Filling (in this case a mic of Sage Sausage and a few vegetables (Onions, Celery, Bell Peppers) and all topped with a baked cheese omelette (A FRITTATA if you want another Italian word). Hands down, One of my favorite breakfast. This is a leftover meal. Uses day old bread, whatever extras you have in the fridge (I used spinach and onions but almost any combination of vegetables work... Or add sausage, chicken or BACON). And don't skip that simple sauteed tomato topping for added DELICIOUSNESS! Savory Bread Pudding (Budino di pane salato)... Pizza Strata Breakfast food, or a delicious main course at night. Layered with pizza toppings (sausage tomato sauce and mozzarella), the layered custard bottom and the crispy French toast top makes this a more complex version of a southern bread pudding... and DELICIOUS! Cheesy Savory Chicken Monkey Bread for 2 People... 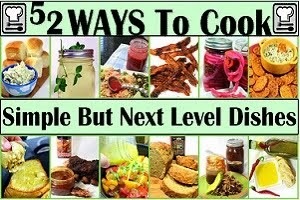 SO EASY and I added LOTS and LOTS of tips and photo how to's that will GUARANTEE a success. DELICIOUS RECIPE, Cheese Chicken Onions and eggy custard added to refrigerator biscuits FANTASTIC Breakfast Casserole! 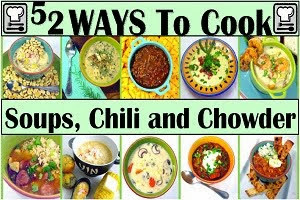 This is a WONDERFUL leftover recipe. Uses leftover pulled pork (recipe for that is included in post). BUT also a tube of Refrigerator Grand Biscuits makes this a 5 minute hands on recipe with a BIG payoff for breakfast. Kind of a fast easy breakfast sandwich that tastes great and uses up leftovers in a new and imaginative way! EASY Chicken Cheese Savory MONKEY BREAD... I made this and served it as the sandwich half of a Soup and Sandwich to brighten up a bowl of leftover soup. BUT, what an amazing breakfast this would make! Made especially easy with a tube of refrigerator biscuits, but it is the taste that will make you want to make again and again. May be the PERFECT use for a rotisserie Chicken! Almost a Classic Quiche Lorraine with a Hash Brown Crust... In My Opinion... Just a little better with a crispy hash brown crust lining a pie crust and filled with the classic ingredients for a Quiche Lorraine... Gruyere Cheese, whipped eggs and Half and Half and seasoned with a little nutmeg... And with the potato crust, real men will LOVE this! Real Men Eat Chicken, Onion and Herb Quiche! Real Men Eat Chicken, Onion and Herb Quiche... PLUS there are instructions for making this in a HASH BROWN CRUST... Now that's a MAN QUICHE!!! Let Them Eat Quiche - Spicy Salami, Tomatoes and Sweet banana Peppers... I do love a quiche... And this is MAN flavored, spicy, meaty and a delicious recipe! Real men will LOVE THIS Loaded up Egg Pie! All in one heavy Cast Iron Oven Proof Skillet... Brown the sausage, Make the gravy and finally BAKE the whole thing with biscuits dropped on the sausage gravy. You end up with crunchy crispy topped biscuits, fluffy moist and tender, light and flaky center and a dumpling like consistency on the bottom. Combined with a rich thick flavorful sage gravy and Sausage and this one skillet meal is THE BEST BREAKFAST EVER (to me)!!! Yee Haa Cow Puncher, now this is a BREAKFAST! Spicy Chorizo Sausage is combined with Tortilla strips (Soaked in liquid flavored spices), Onions and Peppers and cheeses and green chilies. Cooled with cheese and sour cream and served with Cowboy 'Taters and Scrambled Eggs. Classic Spanish Cuisine gets a South West Makeover... WOW and YEE HAA! Biscuits and Gravy and Potatoes and Rosemary... Left over biscuits, a little Rotisserie Chicken and some fresh made chicken/milk gravy,... the classic and for good reasons! 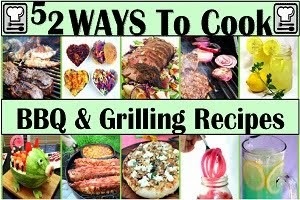 - Grilling Time Main Dish AND A great easy Breakfast!... So easy and so fast, but one of my favorite meals ever. Makes the ingredients shine on their own. Ready in minutes and tastes GREAT! It's a really good breakfast... Kind of a deconstruction of a cowboy potato hash with fancy poached eggs (and sure, a big platter of the hash topped with some fried eggs or even scrambled eggs would work just fine). Add some spinach for color, healthy living... BUT THERE IS A TREAT, a SURPRISE BACON - SOUR CREAM Sauce that sends the whole thing beyond a cowboy hash scramble. The whole thing takes less than 30 minutes and makes a beautiful tasty dish for breakfast, brunch and even dinner! Sweet Potato Chicken and Apple HASH... Do you get in an "I WANT TO EAT HEALTHY TONIGHT" mood, then this is the dish for you... Lots of always in season root vegetables, easy to get meat from a store bought rotisserie chicken all made sweet with a sauteed APPLE! Healthy and delicious... Add an egg and healthy and delicious and pretty! Rosemary Potato Hot Dog Hash... WOW Was this good... REALLY REALLY GOOD. First, the rosemary crispy fried potatoes. But the rest of the hash (onions and peppers) are sauteed and seasoned in the renderings from the hot dogs which also fry up crispy. All topped with eggs and garnished with drizzles of BBQ Sauce! AND THE KIDS LOVE HOT DOGS FOR BREAKFAST! Breakfast Biscuit PIZZA Fast and Easy Quattro Stagioni, Italian 4 Seasons Pizza - 52 Pizza Party Pizzas... A CAN OF REFRIGERATOR BISCUITS becomes a fast and easy appetizer platter (or Breakfast) of 16 mini pizzas. I made 4 different toppings (symbolic of the 4 seasons), but adaptable for ANY TOPPING (Taco, Mushroom... how about a meatball for a bouquet of Daisies look). FAST EASY AND SPECTACULAR FUN BREAKFAST! I have a secret. I love very easy recipes that have the illusion of being complicated, and look spectacular (dare I say Restaurant Quality Presentation). You can make a simple version of this sandwich in 5 minutes ...You can make a ham and cheese and egg sandwich with just a tiny bit of effort, maybe an extra 5 minutes. But this spectacular presentation takes less than 15 minutes. Kentucky HOT BROWN... Well, the Kansas Version... Made with chicken, inspired by a dish from the roaring 20's, converted to a heart warming breakfast dish... An AMAZING open faced sandwich and a perfect one of my "52 Uses for a Rotisserie Chicken"!!! I love leftovers. I especially love to make an all new dish with just hints of the original and NOTHING is better than these Italian version of an omelette! It only takes a few bites of the original dish to make a breakfast for 2! EASY AND FAST!!! Yet another BEST USE OF LEFTOVERS EVER RECIPE... Those BIG chunky French Fried potatoes, some grilled onions and a delicious Blue Cheese sauce combine to make an Italian Omelette. Now becoming a weekly habit of Breakfast in bed, Sunday paper and a FRITATTA! Easiest Omelette EVER! And just about anything you had for dinner last night makes a fantastic Fritatta! An Italian Omelette is the BEST way to use up leftovers! This week I made an Italian Meatloaf. Loaded with meat of course but also Carrots, Celery and Onions. Sounds like great ingredients for a delicious FRITATTA Breakfast! Last night I ate STEAK... Next morning I am chowing down on the ULTIMATE USE FOR LEFTOVERS, the Italian Omelette known as a FRITATTA! It feel so indulgent to eat steak for breakfast. this way you can use small amounts of leftovers to make a Fritatta for TWO! The Italian Omelette, SO EASY and the perfect canvas to use up last night's Leftovers. 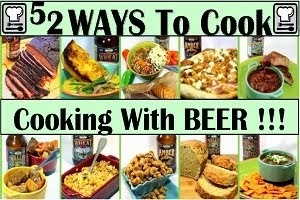 This has all the ingredients of a classic CAJUN New Orleans Jambalaya all flavored with Beer ... The next morning, add the eggs and you have a Cajun version of Egg Foo Young... with hints of the hair of the dog that bit you (BEER)! I love this series. Last Night I had a rare delivery of Chinese Take out. The sticky sweet spicy Chinese dish of Sesame Chicken became my breakfast of an Italian Omelette. So easy and SO TASTY!!! It's almost a Quiche Lorraine Fritatta, but I added some Tomatoes and Spinach for color AND some AMAZING Glazed BACON... BOURBON - MAPLE SYRUP - FRESH CRACKED PEPPER BACON BACON BACON best omelette EVER! I Smoked some baby back ribs last night and they were glazed and seasoned enough that all I had to do was add the eggs to make a DELICIOUS EASY BREAKFAST MEAL from the last couple of bones worth of meat... The PERFECT USE FOR LEFTOVERS! Pulled Pork is a wonderful thing. And a logical way to turn BBQ into an ITALIAN Breakfast,,, Creamy whisked eggs, BBQ, Peppers and Onions and garnished with a drizzle of BBQ Sauce... All the how tos and tricks for authenticity and the ingredients for deliciousness! ... Slapped in the face with Nostalgia, t's been years since I had a Tater Tot and gods forgive me, I LOVED EM... Hash Browns and Eggs... 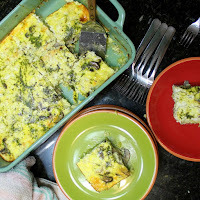 Sounds like a Fritatta (Italian Omelette) Idea to me and I LOVED THIS!!! Taking advantage of sale prices makes this one of my most affordable (OK CHEAP) meals. And filled with ingredients that makes for a great breakfast. Italian Omelette at it;s best! CHEAP, FAST FOOD AND EASY!